You want to take off effortlessly with your passenger for a stress-free flying experience? The BIBETA 5 can fully satisfy this requirement. Its excellent takeoff behaviour as well as efficient turning flight and landing identify the BIBETA 5 as an absolutely reliable partner. Just a brief impulse and already the canopy is climbing evenly above you and your guest – the BIBETA 5’s easy inflating and rising mean that you and your passenger leave the ground in a relaxed frame of mind, ready to enjoy the flight. Even in difficult takeoff conditions the BIBETA 5 is a partner which you can fully rely on. 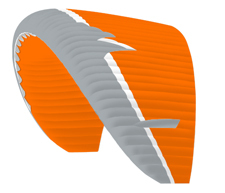 The BIBETA 5’s internal conformation has been further improved by means of detailed analysis and calculation: the weight-efficient structure and the use of Nylon wires make the wing lighter. Equipped with performance-enhancing trimmers and the established Vary-Grip big ears system the BIBETA 5 stands for efficiency and precision. The BIBETA 5 is a reliable and hard-wearing partner. 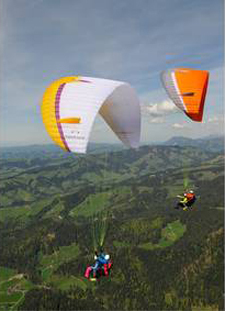 The optimised internal structure combined with a careful choice of materials make the BIBETA 5 a light but robust and long-lived wing that will, even after frequent use, remain hard-wearing, retaining its takeoff qualities and canopy stability.